At the Hour of the Ox (between 1-3 A.M.) a lone figure creeps silently towards a sacred tree. She is dressed in white, and on her head an upturned trivet is worn like a crown, three candles burning in the night. In one hand, she carries a doll made of bound straw in the form of a person; in her other hand, a small wooden hammer and a set of long, iron spikes. The hatred in her heart blazes brighter than the candles, appropriate for one completing the curse-ritual known as Ushi no Koku Mairi, the Shrine Visit at the Hour of the Ox. Ushi no Koku Mairi (丑の刻参り; also known as 丑の時参; Ushi no Toki Mairi, both of which translate as Shrine Visit at the Hour of the Ox) is an ancient, famous, and terrible Japanese curse-ritual. It has been performed for millennia—some sources trace it back as far as the Kofun period (250 – 538 CE), although in a different form. While the costume and ritual have changed over the centuries, the basic rite of pounding nails into dolls remains the same. To perform an Ushi no Koku Mairi, you first make a straw doll (藁人形; waraningyo) to serve as an effigy of the person you want to curse. For the best effect, the doll should have some part of the person in it, some hair, skin, blood, fingernails, or other DNA. In a pinch a photograph will do, or even their name written on a piece of paper. This done, you done the ritual costume, and sneak into a shrine late at night. Many Shinto shrines have sacred trees, called shinboku, that are the homes of kami spirits. Nail the doll to the sacred tree using long, iron spikes called gosunkugi (五寸釘). As stated in the name, the timing is very important. The ritual can only be completed at the Hour of the Ox, between 1-3 A.M. in the ancient method of counting time in Japan. The Hour of the Ox is the traditional Witching Hour in Japan, a time when yurei and yokai and other evil spirits come haunting. And most importantly—the ritual must be done in secret; it is said that if anyone sees you performing Ushi no Koku Mairi, the curse will rebound on the caster. Unless, of course, the eyewitness is immediately slain. How many times you perform the ritual vary; some say that you must go back seven nights, pounding in a single nail each night. The final nail goes into the head, which will kill the cursed person. The results of the curse vary as well—some say the cursed person will sicken and die. Some say that, like a Voodoo doll, the cursed person will feel pain where the spikes are hammered in. Some say it is a summoning ritual, and that performing an Ushi no Koku Mairi summons a vengeful spirit to torment and ultimately destroy the recipient. An important component to the ritual is the costume. One does not simply waltz into a shrine and pound a doll into a tree. The costume is a demonstration of your intention, and is more than just decoration; the curse is said to be so terrible that in order to be effective you must become a demon yourself. Although the costume has changed over the years (and there are numerous variations depending on your source), the most recognizable version comes from the Edo period, and is still associated with the ritual. Some variations of the costume swap out a headband and two candles for the trivet, but I think if you are going to do it, go all out. No one really knows how old the ritual really is. In the Nara National Research Institute for Cultural Properties, the is an 8th century relic from an archeological dig of a doll made of bound wooden strips with an iron nail shoved through the chest. This is from a time when iron had just been introduced into Japan, and would have been a rare commodity. In the ruins of Datecho in Shimane prefecture, Matsue City, archeologists found a wooden plaque with a painting of a court lady that had wooden spikes pounded through it. It is known that dolls for curses were used by Onmyoji , the yin/yang sorcerers of the Heian period (794 – 1185 CE). Going to the shrine at the Hour of the Ox has not always been associated with curses, however. Old records show that people originally snuck in to pray, and that during these nighttime visits your pleas to the kami were more likely to be answered. Somehow, along the way, these prayers for a kami’s blessing turned into prayers for a kami’s curse. One of the oldest written accounts of the ritual comes from the Sword scroll of the Kamakura period epic poem The Tale of the Heike. It differs from modern accounts—the costume calls for you to bind your hair into five braids, to use bound-together pine branches threaded into an iron ring for torches, and to cake your face in red vermillion clay instead of painted white. Also, instead of a late-night sneak visit to a shrine, the curser runs down the street shouting their curse for all to hear. According to the story, the ritual was taught to a woman by a kami spirit, after she prayed for revenge at a local shrine. The woman would transform into the monstrous Hashi Hime (Bridge Princess), still wearing her frightful costume. In the Muromachi period (1337 to 1573 CE), a Noh play called Kanawa (鉄輪; Iron Ring)is credited with drawing a connection between the Onmyodo doll ritual and the costume of the Hashi Hime, creating the first account of the Ushi no Koku Mairi as it is known today. By the Edo period, the Ushi no Koku Mairi was firmly established and illustrated by artists in kaidan-shu collections of stories of the strange. One of the main differences in Edo period artists was the results of the ritual—many preferred to show some evil spirit or god lurking in the background, waiting to be summoned by the completed ritual. Not all shrines are created equal for Ushi no Koku Mairi. Kifune Jinja in Kyoto and Ikurei Jinja in Niimi, Okayama, are famous sites for Ushi no Koku Mairi, as is Jishu Jinja, a small shrine located near the Kyoto Buddhist temple Kiyomizudera. If you look carefully, these sacred sites have shinboku trees that still bear the scars of centuries of iron nails pounded in by vengeance-seekers. And if all this seems like a lot of work to put together, don’t worry. In the modern world, a complete Ushi no Koku Mairi kit can be ordered online. But be careful, performers of the ritual can be prosecuted under Japanese law. The Ushi no Koku Mairi was a difficult project–difficult in knowing what to leave in, and what to leave out. There are SO many different variations on the ritual it would be impossible to include them all. I tried to add in what I thought was relevant, and appeared in the highest number of resources. But this is by no means a complete account. This is the second of my trivet-wearing yokai stories. Next up is a direct ancestor of the Ushi no Koku Mairi, the Hashi Hime. 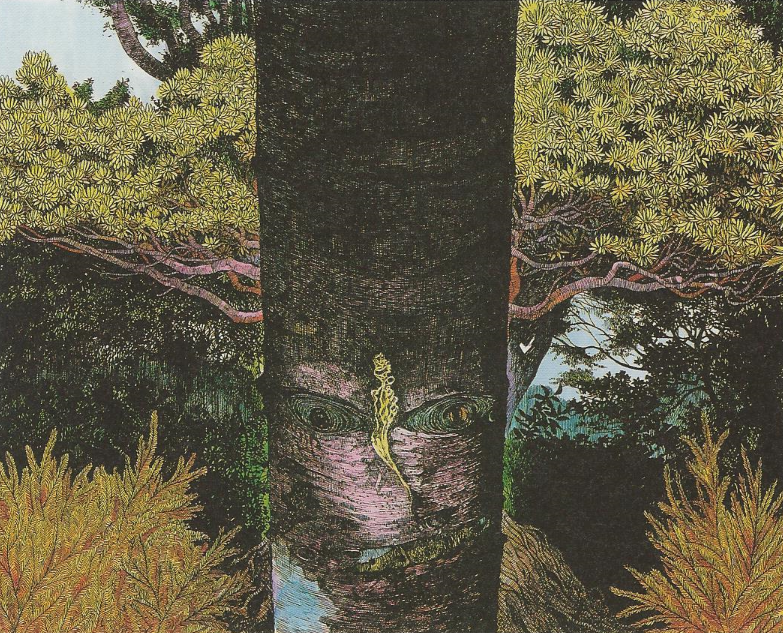 From ancient times in Japan, certain types of trees were thought to be abodes for kami, the spiritual deities of Japan’s native animistic religion. Specific trees such as the Chinese bunyan tree or the Indian laurel were said to be favored by these kami. The importance of these tree-dwelling kami was established in the Kojiki (Record of Ancient Matters), where the legend is told of the founding sibling gods of Japan Izanagi and Izanami. 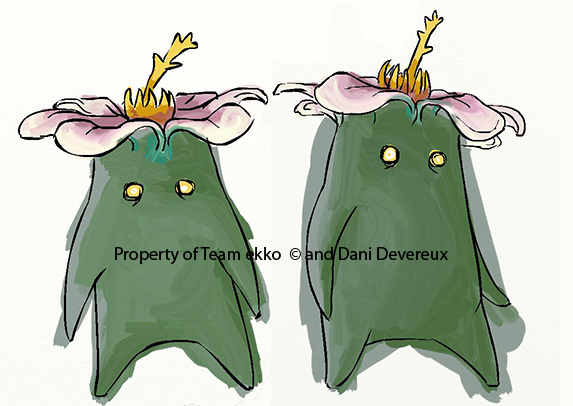 The two gave birth to hundreds of thousands of godling children, but their second-born was the kami of the trees. 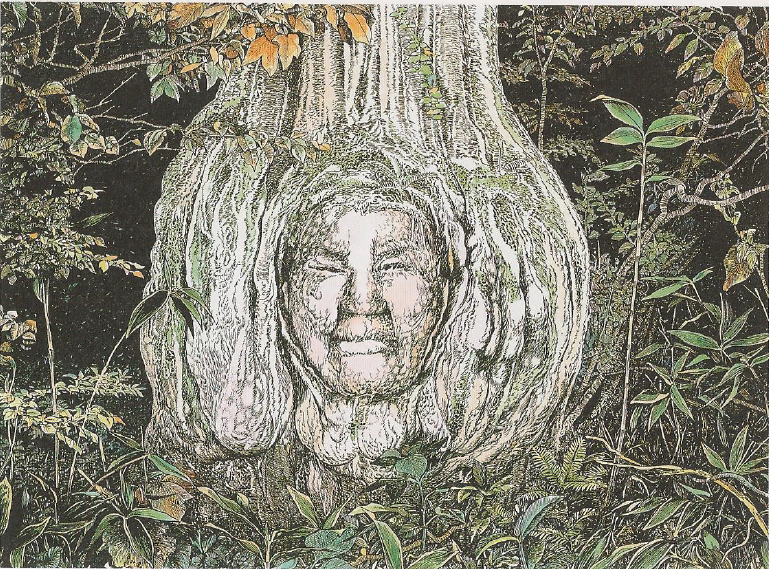 All around Japan you can see trees that resemble humans in some uncanny way. Legends say this comes from the kami spirits who dwell inside. Called Jiyushin (), shinboku (神木), or kodama (古多万), these sacred trees are often found on the grounds of Shinto shrines or Buddhist temples. 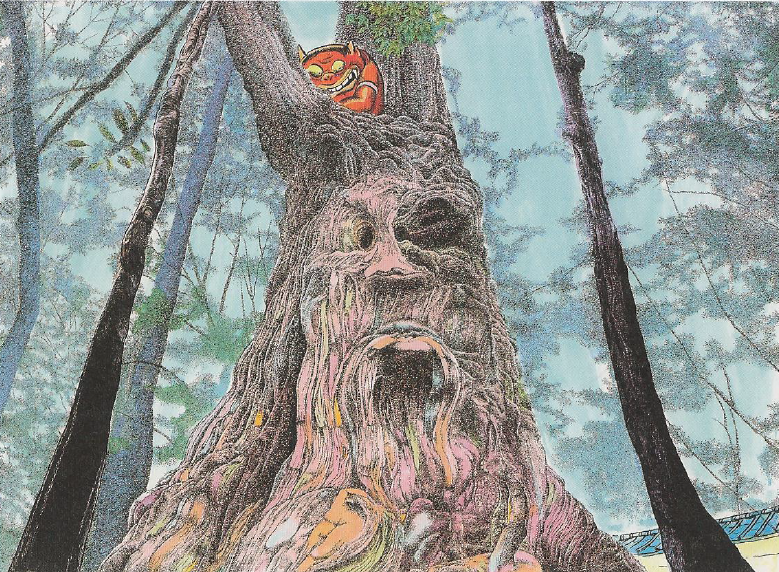 The spirits that dwell in the trees are said to offer protection to worshipers and watch over homes in the vicinity. At the same time, these trees offer protection to the kami themselves, giving them a physical space to inhabit. It is sometimes said that the kami come down to earth from heaven, but they cannot remain in their natural state. The holy trees act as a medium, giving the spiritual essence of the kami somewhere to exist while they are in the human realm. They resonate with trees of a certain shape—it is said spiritual energy of the kami can be felt the most strongly in trees that have double, or even triple, trunks. 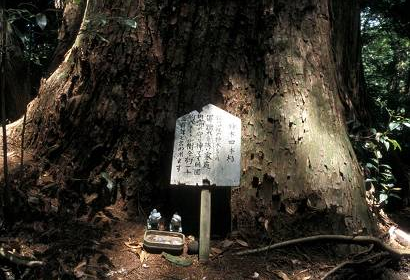 There are still shrines throughout Japan that venerate local tree-dwelling kami. Many of these are found in the mountains, where the trees are said to be inhabited by various mountain kami or even ancestor spirits. But no matter the origin, when they kami take up residence in a tree they are called ki no kami, the gods in the trees. This is another magical tree legend, with a different take than the previously translated moidon. The fundamental concept is different, in that the moidon are themselves gods (kami) while the ki no kami are more like dryads in the European tradition (Notice I said “more like.” Obviously they are not exactly alike). The trees are just the shells the spirits inhabit while on earth. And kami can be fickle things. All over Japan you can see several abandoned shrines that look as though the kami has left them. The Moidon’s name tells you exactly what it is. The word moi (森) means “forest,” and the word don (殿) means “Lord.” It is a title of honor bestowed upon grand and aged trees. In ancient Japan, long before there was any sort of organized religion, people believed that these great trees were deities and the land they inhabited was a sacred space. Southern Kyushu in particular is home to moidon, although on Osumi peninsula they are called moriyama. In Kagoshima prefecture you can find more than a hundred moidon. Long before any shrines were built, moidon served as places of worship to the ancient Japanese. Very old and massive trees were said to be the bodies for gods. In particular, broad-leaf evergreen trees were considered to be moidon, such as beech, camphor, and fig trees. In modern day Shinto, you can still see moidon that existed long before the buildings were built. Indeed, many of those oldest shrines were built around a particular moidon, as the area was already considered a sacred space by virtue of the tree. In Hioki ward, Ichiki city, there is a moidon whose festival is celebrated every year. On November 5th, by the counting of the old Japanese lunar calendar, people eat festive red rice to mark the occasion, and a dish is always set in front of the tree as an offering. However it is said that if you take a single leaf home, or if any part of the great tree is burned as firewood, you will fall under its curse. Moidon were long worshiped as gods, but they were also greatly feared. It is said that moidon are quick to take offense, and bestow curses more readily than blessings. Those who ask too much of them, or who gather their fallen branches to burn, will find themselves stricken with various illnesses, including a burning, itchy skin. Sometimes doing so much as to touch the tree brings about its curse, so villagers are often careful to give their moidon trees a wide birth except at festival time. Because of their ability to curse, it is thought that these lords of the forest may be one of the origins of yokai legends throughout Japan. A new translation at last! Sorry about the delay, but work has kept me very busy as of late. The moidon is a choshizen type of yokai, referring to a sort of natural phenomenon. As Mizuki Shigeru says, you can still see these ancient trees in old Shinto shrines, usually demarcated by a straw rope and other sacred symbols. When I lived in Nara prefecture, I used to go to Miwa shrine that had a massive, ancient tree that was said to be much older than the shrine itself, which was already several centuries old. This tree is found in mountain valleys. The fruit of the tree looks like a human head. It doesn’t say a word, but it is constantly laughing. It is said that if the fruit laughs too heartily, it falls from the tree. 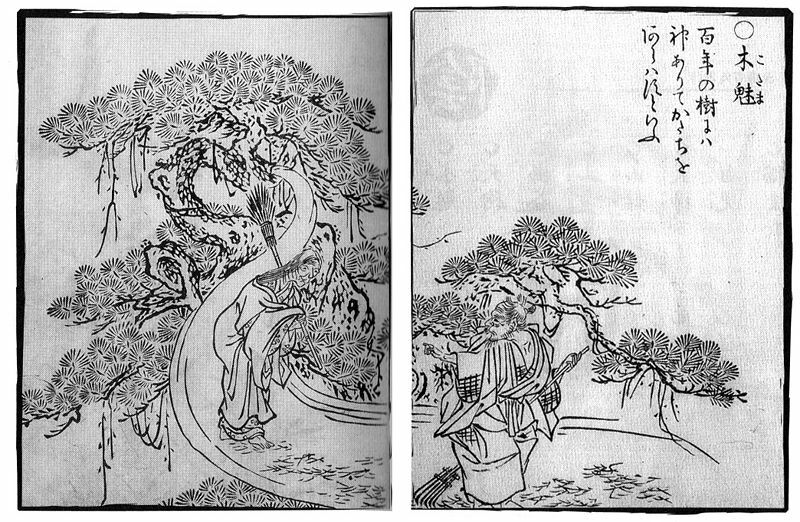 According to the Edo period Hyakka Jiten encyclopedia Wakan Sansai Zue (和漢三才図会; A Collection of Pictures of Heaven, Earth, and Man from China and Japan), the Jinmenju trees are found in the south, and the fruit of the tree is called the jinmenshi, or human-faced child. They ripen in the fall, and if you eat the fruit they have a sweet/sour taste. It is said that the Jinmenju seed also has a human face, eyes, ears, nose, and mouth. It is possible that the trees were all eaten and it is why we don’t see them today. In the past however, it was said that people planted great orchards of the laughing Jinmenju. That must have been a beautiful sight. The legend of the Jinmenju comes from China, and was passed onto Japan where it was considered to be a yokai due to its peculiar nature. There are also stories of trees bearing human-faced fruit from India and Persia, usually with the faces of beautiful girls. 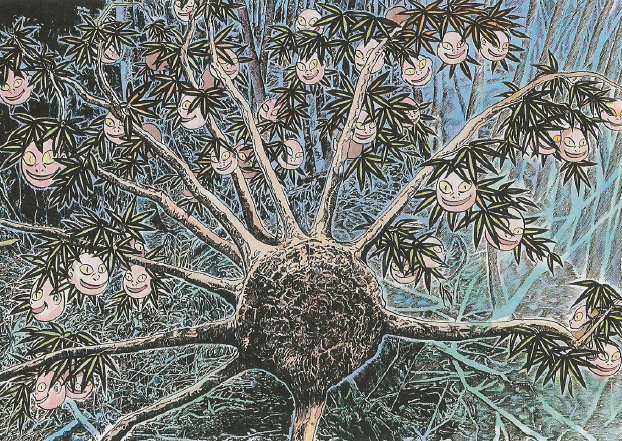 Even now, when you walk through the forest you can see trees whose roots bear a resemblance to human and yokai faces. I have five pictures of trees like this in my photo albums. I wonder if this is some new species of Jinmenju? 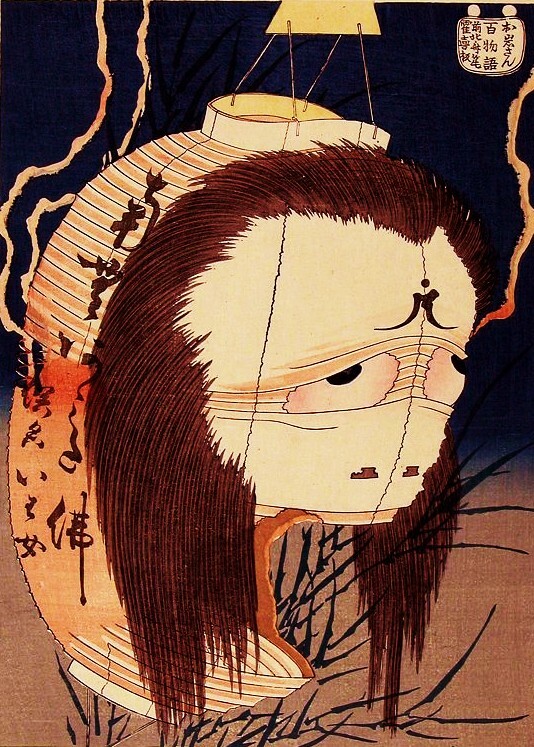 Most people think of yokai as some kind of monster, but the Jinmenju is a type of yokai called choshizen, or super-nature, which includes mysterious plants and animals. 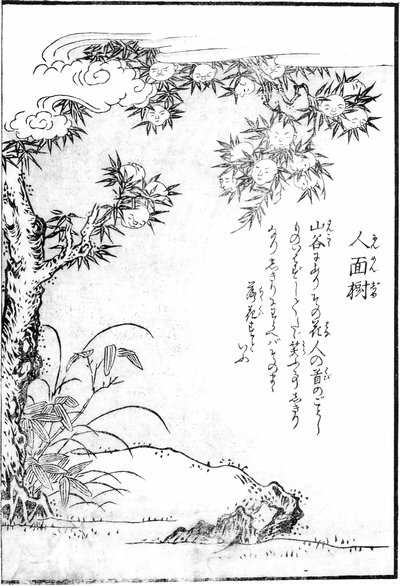 Toriyama Sekien included the Jinmenju in his collection Konjyaku Hyakki Shui (今昔百鬼拾遺; Supplement to The Hundred Demons from the Present and the Past). All Jinmenju stories have their origin in a Chinese book Sansai Zue(三才図会; A Collection of Pictures of Heaven, Earth, and Man). 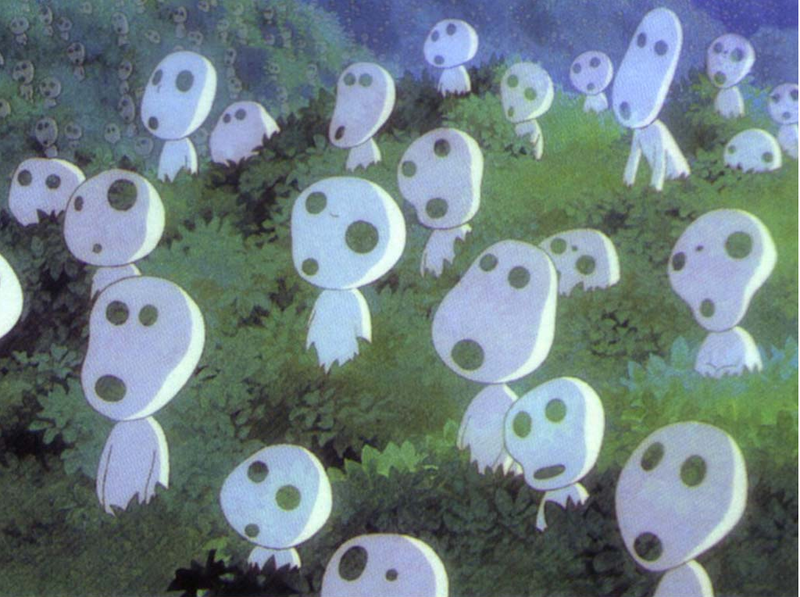 This entry was translated for Dan Tsukasa, who is developing a Japanese folklore video game called Kodama. (Which you all should all check out!) I am helping Dan out with some yokai info for the game, part of which takes place in a magic forest. So look forward to some more choshizen offerings.